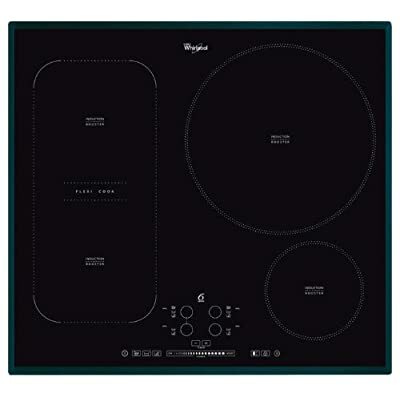 The Whirlpool Induction Hob ACM 847, is one of the most intelligent of hobs. Programmed with advanced sensor technology, this hob can be set to melt, simmer and boil. Sensors monitor the temperature of your pan throughout cooking. It can adjust the power to boost the temperature to reach a boiling point quickly, beeps to let you know when it has reached boiling point, and automatically reduces the power to maintain a steady boil. This hob's intelligence means you can be distracted whilst cooking as it will keep your food cooking at an optimum temperature. Induction hobs can be four times more energy efficient than gas hobs and so can provide a cost-effective way to cook. The sensors in the ACM 847 monitor your cooking, continually preventing you from over-cooking food and therefore overusing on energy. The left-hand side of the ACM 847 has one large cooking zone allowing you to have full flexibility with the size of the pan that you cook with in this space. The pan of your choice conducts heat from the hob and so only the space your pan occupies is heated. Not only does this save on energy but you can use this space for 3 small pans, or even one large pan. If you do use this space for more than one pan, you can have separate cooking powers for each pan within this one zone. In addition to this hob's sensor technology, making cooking life much simpler, this hob also has a 5000 Watt booster level, allowing you to heat food rapidly. This booster level means you can boil 2.5 litres of water in as little as four minutes. It also has 9 power levels so you have full control over your cooking power. With a black glass surface and touch controls this hob is both stylish in your kitchen and is designed to be easy to wipe clean. The ACM 847 induction hob has a childlock, zone-on indicators, a power-on indicator, automatic pan detection and a booster option.